Pretzel Fooler Salad is the perfect dessert for your summer BBQ or party! It’s light refreshing taste is full of fresh strawberries and the caramelized pretzels make it a hit no matter where you are. The combination of sweet and salty leaves a heavenly taste in your mouth! My family absolutely loves this Pretzel Fooler Salad and we serve it all summer long. The recipe is very easy and turns out perfectly every time! It’s travels great and is a great addition to any summer party or event. Enjoy! Last year we headed down to my mom’s house for the 4th of July weekend and had a fun filled weekend planned! On Friday we headed off to watch fireworks with my brother and sister. Then on Saturday, I had a lunch date with two of my best friends from high school. I had not seen them in about 23 years and we had the best time (I’m showing my age a little here!). Then on Saturday, we had a mini family reunion/BBQ supper of Grilled Cedar Plank Salmon (<<click to see the recipe), corn on the cob, asparagus, deviled eggs and pretzel fooler! This was the first time Charlee Ann tried Pretzel Fooler and she is now the biggest fan! “Oh, mommy! This is so good!” is what I heard each and every time she had some (which was a lot because she kept asking for more). Here it is! The wonderfully spectacular mouth watering Pretzel Fooler Salad! Both sweet and salty… so good and very refreshing! Mix pretzels, melted butter and 1/4 cup sugar in a medium bowl. Spread in a 9X13 baking pan and bake at 350 degrees for 10 minutes. Allow to cool. In a large bowl mix together 1-8oz package of cream cheese (softened), 1 cup sugar and 1 1/2 cups cool whip. Mix well and spread on top of pretzels.Set in the refrigerator to chill. Dissolve jello in HOT pineapple juice. Add strawberries with any juice that they have created after cutting to the jello. Refrigerate until partially set. Spread over top of the cream cheese layer. Refrigerate over night or at least 4 hours. Did you eat out over the weekend?? Got any good recipes to share with us? I have definitley never had anything like that. It sounds delicious and I would love to try it sometime. Yum yum yum! I love this! I am going to add it to my summer list of must-makes! It looks so good! That looks so delicious! I’ve seen that at get togethers I’ve been to, but it is usually gone before I can get some! I had this at a event at work. One of the girls brought it in – it is delicious! 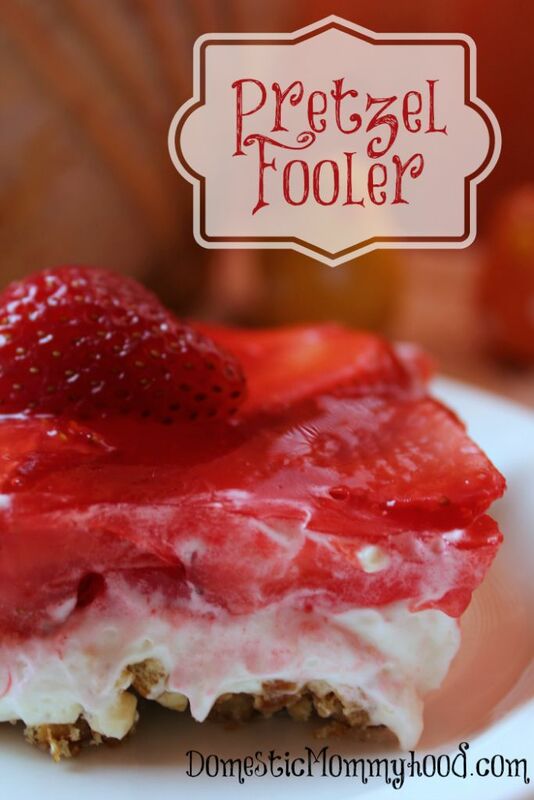 I pinned your recipe…perfect dessert for my party at the end of July! I love any dessert with strawberries in it! Looks good! This sounds great,I will have to try this i love pretzels and strawberries so would be perfect. We have a different name for it, but that salty/sweet goodness is the same. One of my favorites! That looks really good. I will have to try it. That looks delicious! I could grab some gluten free pretzels and make a GF version! I absolutely love this dessert. I’m pinning your recipe b/c the last time I tried to make the one I had, it was a disaster. That looks really Really tasty. Can’t wait to try it. This is a family favorite at our house! It’s definitely best served as soon as possible! My first time seeing this dish. Looks amazing! Oh gosh! My aunt used to make this when I was younger. I had no idea what it was called. I just remember the salt from the pretzels and then the berries and cream. Thank you! I love pretzels with sweet things…yay for salty and sweet! That looks and sounds amazing! I’ve never thought about using pretzels and strawberries together in a recipe! What? I need that in my belly right now! I love sweet and salty. That is so cool! I’ve never seen a dish quite like this one. This salad looks so delicious! Anything with pretzels in it, I am sure I will love! Sounds delicious! Looks amazing too! I LOVE sweet and salty desserts! This looks so yummy I can’t wait to try it for myself! This is geniusously delicious looking! Going on my must make list now! That’s an interesting name! I love the combo of sweet and salty! The crushed pretzels make this for me. It looks and sounds delicious. I keep meaning to try this. Just tweeted it to remind myself. Looks so yummy! I love making this! It’s a hit at picnic and cookouts for sure. I’ve never seen anything like this! It’s perfect for dessert at a summer BBQ! Mmm, I love the sweet and salty combination. This sounds like a picnic win to me! Neat! Always looking for something different and this is definitely different. I think I could easily do this too! Oh my gosh you have it all! Sweet and Salty, creamy and crunchy – yum! I am always looking for new recipes, the ones that are completely unique. Your Pretzel Fooler recipe really fills the bill. I have not eaten anything like it. This looks and sounds delicious, I cannot wait to try it. The fact that this is fast and easy to make is another plus, thank you for sharing this recipe. This recipe looks real tasty. I’ll have to try it sometime with GF pretzels. Mmm, these look delicious! I was sold the moment I saw the strawberries. I’ve never had anything like this before. It seems like such an easy recipe! I’ll have to try it sometime soon. I did eat BBQ over the weekend. I’ve never heard of a Pretzer Fooler salad thats interesting I need a sample! I haven’t heard of this. The sweet and salty of it sounds really good. It looks refreshing too! My favorite combo is salty and sweet. Can’t wait to try this recipe! Love this and it makes me want some right now! Salty and sweet! I don’t think I’ve had it with the pineapples before though! This looks very tasty to take to an upcoming reunion. You have some wonderful recipes. Well, that’s sure new to me, but looks absolutely delicious! Thanks for coming and linking up at The Weekend Social Party. All posts get pinned on our pinterest board! Please be sure to come back next week starting Thursdays at 9PM EST on culinaryflavors.gr ! I hope to see you there! Yummy! This looks so refreshing and tasty. Yum! A lot of my favorite flavors in one dish!